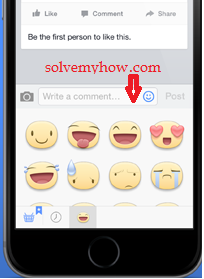 Recently Facebook has come up with the new update called Facebook Comment Stickers. 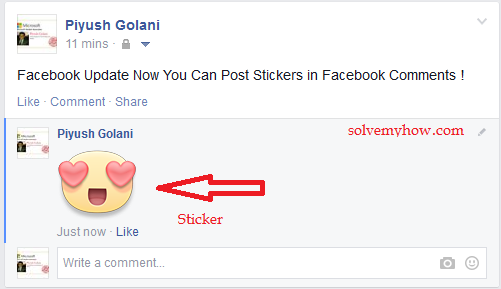 Means now you can comment the stickers in Facebook Comments. Isn't that sounds cool ? So, when some of your friend update the status, Snap, Share the Location and much more. You can simply reply their comments with cool and funny stickers. So, now you can share your emotion with the comments. Till now people were able to send the stickers who're using the Facebook Messenger app or the people who're using Facebook Messenger Desktop version app and that too in chat only. But now Comment Stickers in Facebook Comments ! This update is not only for the web users but also for the mobile phone android and IOS users. The android and IOS phone users who're using the official Facebook app can send the Stickers in Facebook Comments. But, you can't comment Stickers on any Facebook pages. I even can't understand this but this is the fact ! Apparently the entire idea to integrate Stickers in Facebook Comments was began in the Hackathon event held at New York city by the team of Facebook engineers and the whole prototype for the web was developed in the single night. When they liked this updated. They decided to do the update for mobile phone users also. So, lately it was added in the android and IOS "Facebook app" in the Hackathon event held at California City. Do you like this update from Facebook and in what other ways you're using Facebook Comment Stickers ? Please share it via comments ! Add Facebook Comments Box Plugin To Blogger Blogs - Latest !